From left to right: Angelina Zhang, Suzanne Starzyk, Luiza DaSilveira, Dylan Porges, and Audrey Orange. 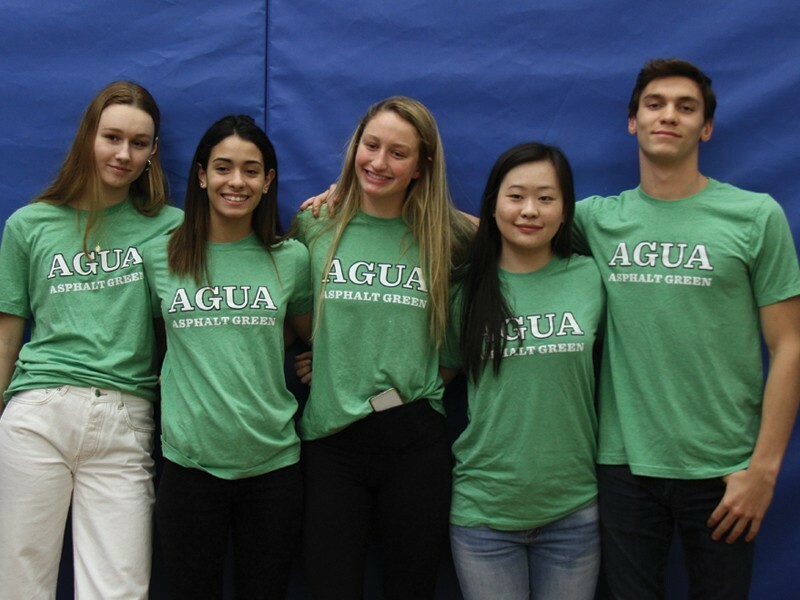 Five Asphalt Green Unified Aquatics (AGUA) Swim Team athletes announced their commitment to college programs at a special ceremony at Asphalt Green's Upper East Side campus on January 16. Luiza DaSilveira will attend Iona College; Suzanne Starzyk will attend Claremont McKenna College; Audrey Orange will attend Brown University; Angelina Zhang will attend Massachusetts Institute of Technology; and Dylan Porges will attend Princeton University. AGUA Head Coach David Rodriguez says, "We are incredibly proud of these five outstanding athletes and are excited to celebrate their accomplishments. It has been a pleasure to coach such hardworking individuals. They are exceptional competitors, leaders, and teammates and have bright futures ahead of them in the pool, classroom, and beyond." Luiza DaSilveira is a six-year AGUA competitor with team records in all four of the age 13-14 long course relays. She is a Senior Metropolitan Championship finalist and USA Swimming Futures Championships qualifier. Despite being an AGUA team member for a short period of time, Audrey Orange quickly etched her name in the record books. She combined with her teammates to break the age 15-18 800-meter and 200-yard freestyle relay marks. Individually, she is a USA Swimming Futures Championship qualifier and Metropolitan Senior Championship finalist. She is also a USA Swimming Junior National qualifier and earned USA Swimming Scholastic All-American honors in 2018. Dylan Porges is a four-year AGUA Swim Team member. He holds AGUA team records in the age 15-18 and open 800-meter freestyle, 200-meter butterfly, and age 13-14 200-meter freestyle relay. He is a USA Swimming National Championship qualifier and a USA Swimming Junior National finalist in the 200 butterfly. Dylan has also earned recognition on the national level by earning Scholastic All-America in 2017 and 2018. At the regional level, Dylan earned the men's high point award at the 2018 Senior Metropolitan Championship, leading AGUA to the team title. At the event, he won the 200 butterfly and earned runner-up honors in the 100 butterfly and 200 freestyle. Dylan also competes for his high school, Ethical Culture Fieldston School. He won back-to-back Ivy Prep League 100 butterfly titles and holds school records in the 50, 100, 200, and 500 freestyles, 100 butterfly, 100 backstroke, and 200 IM. Suzanne Starzyk, a two-year AGUA competitor, is a Senior Metropolitan Championships finalist, Speedo Sectionals finalist and USA Swimming Futures Championships qualifier. Angelina Zhang is a four-year member of AGUA and is a USA Swimming Futures Championship qualifier and Senior Metropolitan Championship finalist. She also competes for her high school, Trinity School, and is a three-time Ivy Prep League champion, earning the 100 butterfly title in 2017 and 100 butterfly and 100 backstroke wins in 2018. *Ivy League institutions do not accept National Letters of Intent.